Alastair Cook has marked his final Test innings for England by reaching a century on the morning of day four of the fifth Test against India at The Oval. The 33-year-left-handed opening batsman made 71 in the first innings of the match and resumed on day four unbeaten on 46 in his second knock - with the home side starting the day on 114-2 in their second innings, already 154 runs in front. By lunch Cook had advanced to 103, with his landmark ton coming up courtesy of four overthrows to spark huge celebrations all around The Oval. 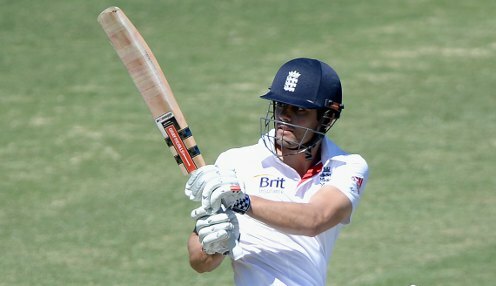 In reaching three figures Cook became only the fifth player to make centuries in both his first and last Test matches, matching the achievements of Reggie Duff, Bill Ponsford, Greg Chappell and Mohammad Azharuddin. Alongside Cook, skipper Joe Root was only eight short of a century of his own when lunch arrived, with England having progressed to 243-2, a lead of 283 runs overall. Root had faced 132 deliveries, hitting 11 fours and one massive six off the bowling of left-arm spinner Ravi Jadeja. England, who hold an unassailable 3-1 lead in the five-match series, are now 1/200 to win the fifth Test, with the draw priced at 20/1 and an Indian victory at 1000/1.